I have been absent from blog land for a bit. Julia was on spring break and we had a lot of time to hang out together. It was really nice to have her home relaxing, not working on homework. Leo, hiding in the corner while Julia waits patiently. Let me introduce you to Leo. He is about 11 weeks old and has a very sweet personality. When Julia brought him home, he was very skittish. Poor little guy was so shy and wanted to hide in a corner of the pen, behind some weeds. Julia was very patient with him and just stayed near him but didn’t try to engage very much at all. It didn’t take more than a few days before he would sniff her hands and come closer to her. She continued to just be with him, letting him approach her. One week later, Leo is so much friendlier. After the five days or so, Leo became very comfortable. 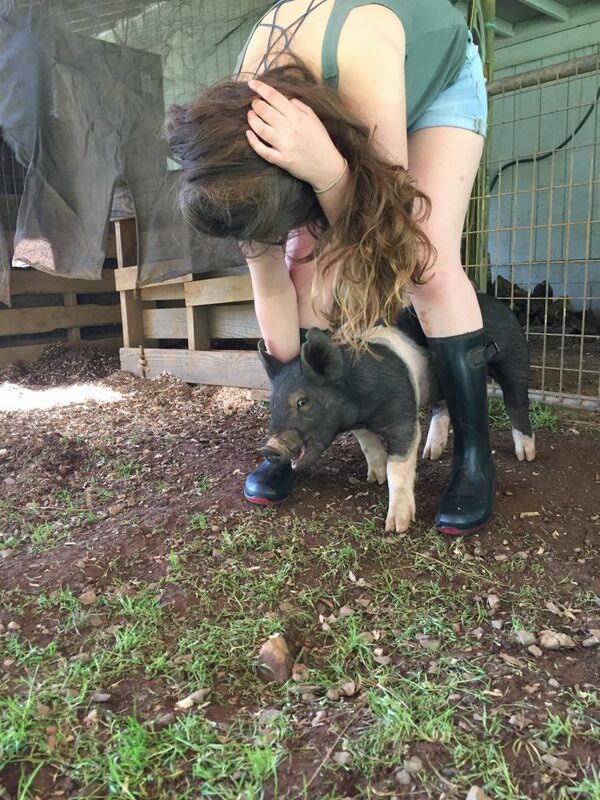 He has gotten very social and loves to be scratched and rubbed whenever Julia is out with him. Look at his cute smile! Now they are best friends. He will not leave her side if she is in the pen. He nuzzles her legs and wants all of her attention. She did such a good job of gaining his trust and this will make it much easier for her when she starts to train him for showmanship. In between playing with Leo, we did go do a few fun things. 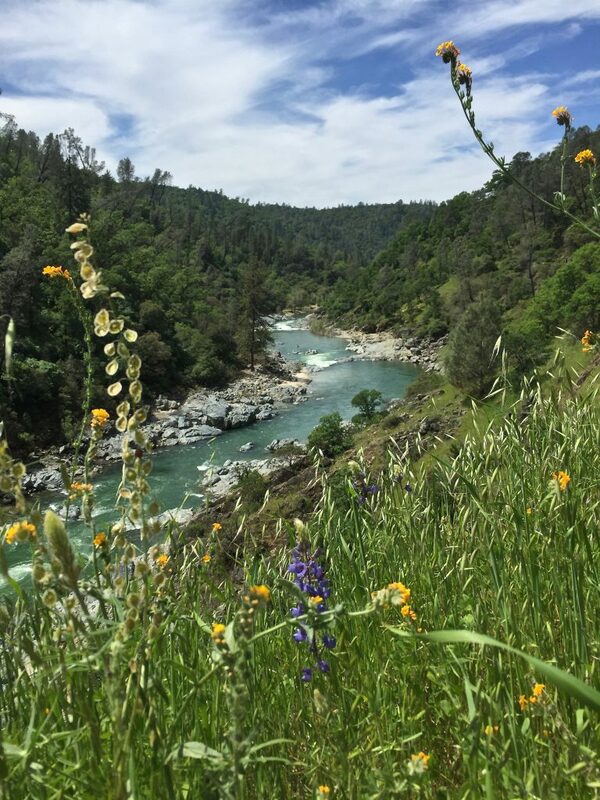 One day we took a hike on the Buttermilk Bend trail along the South Yuba River. 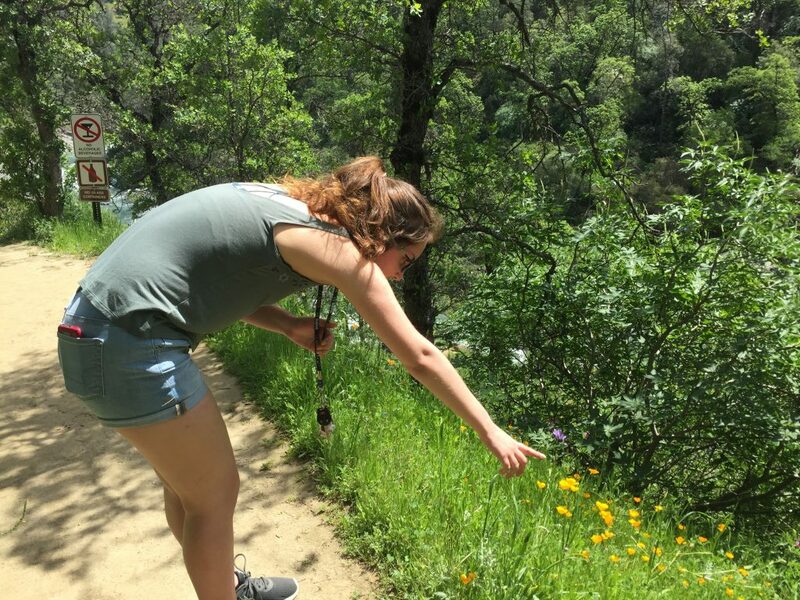 The wildflowers are gorgeous this time of year. 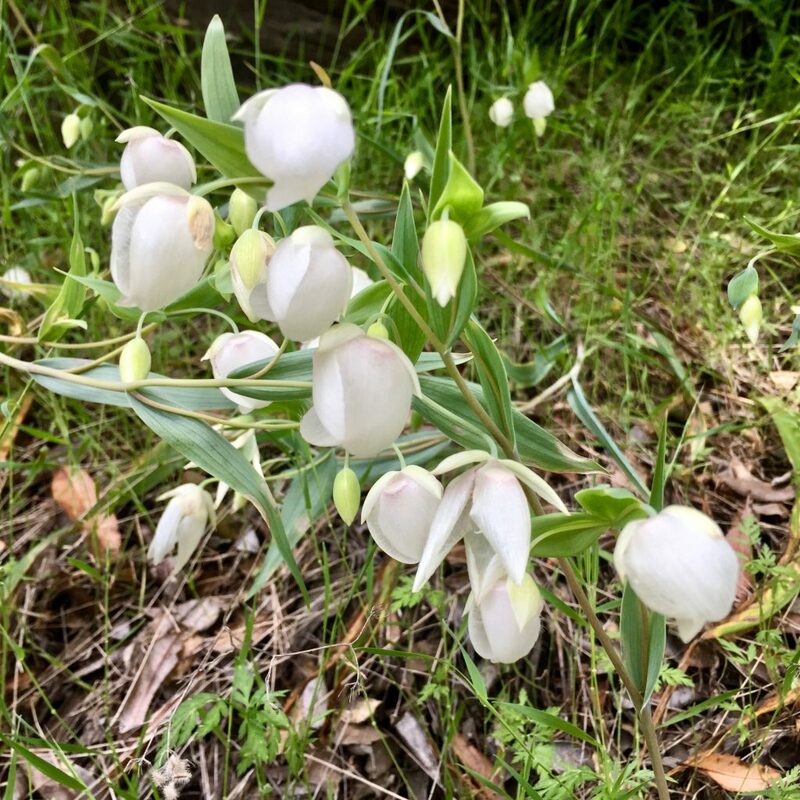 These wild lillies are one of may favorites. 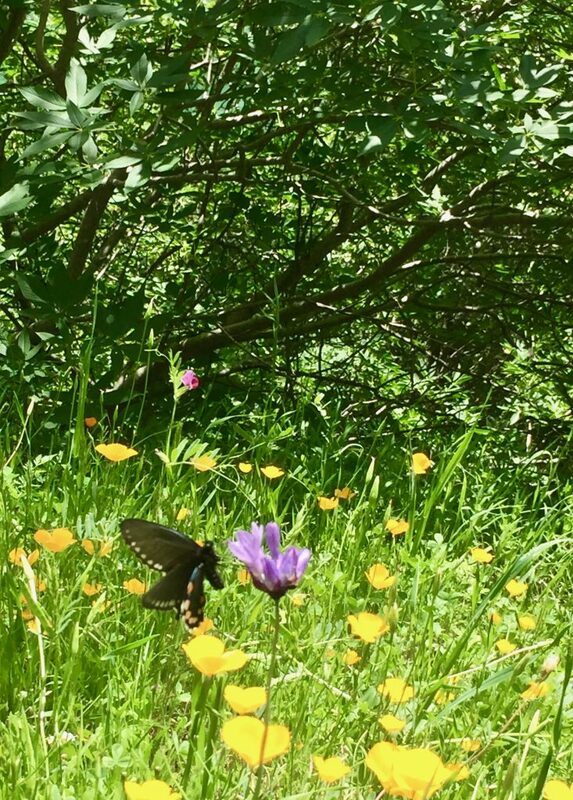 With so many wildflowers, comes an abundance of butterflies. There were many and we enjoyed watching them. Try as she might, Julia couldn’t get one to land on her hand. At home everything is blooming too! 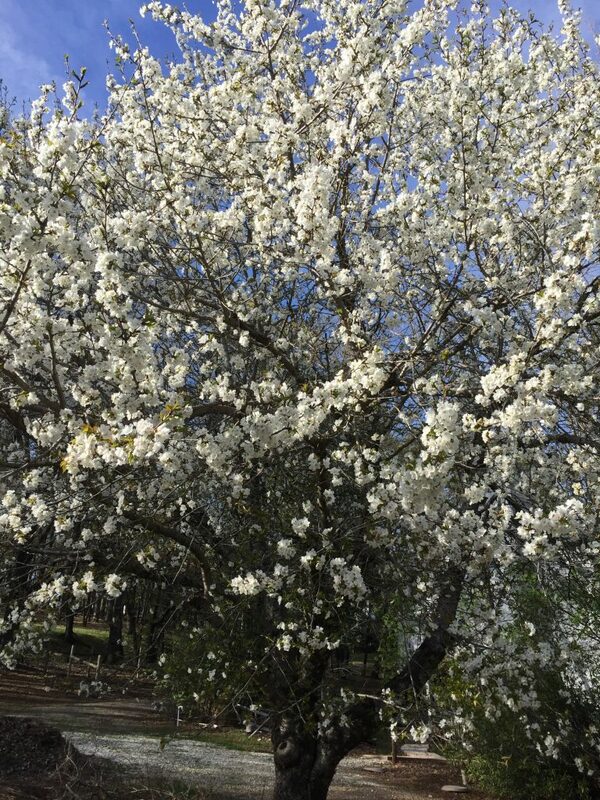 This is our cherry tree. Each season it is anyone’s guess whether we will get cherries. Judging by the incredible bloom we have this year, I am feeling hopeful we will have fruit. The birds take more than their share, but I think we will have some to enjoy as well. 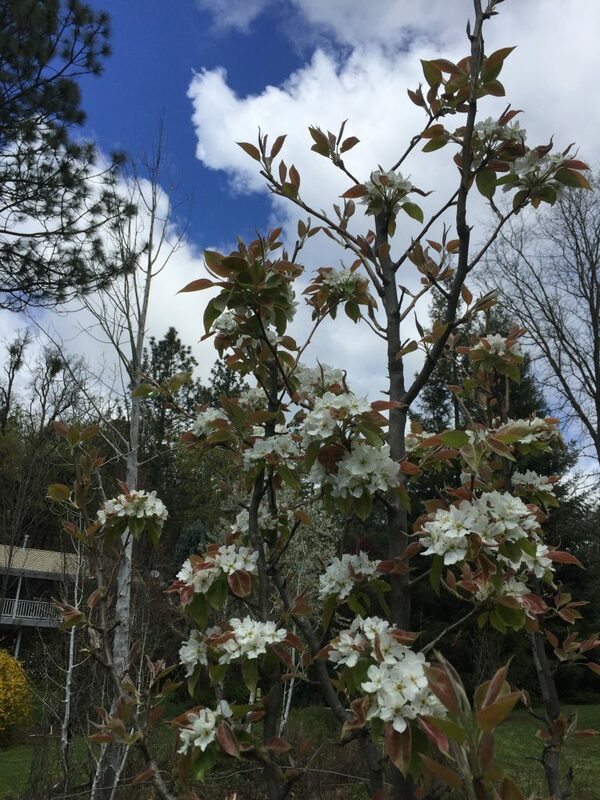 We have two Asian Pear Apple trees, each of which are about four or five years old. This is a strong blossom year for both of them so maybe we will get fruit! Last year I think we only had two or three apples and they were not very big. Crossing fingers for this year. 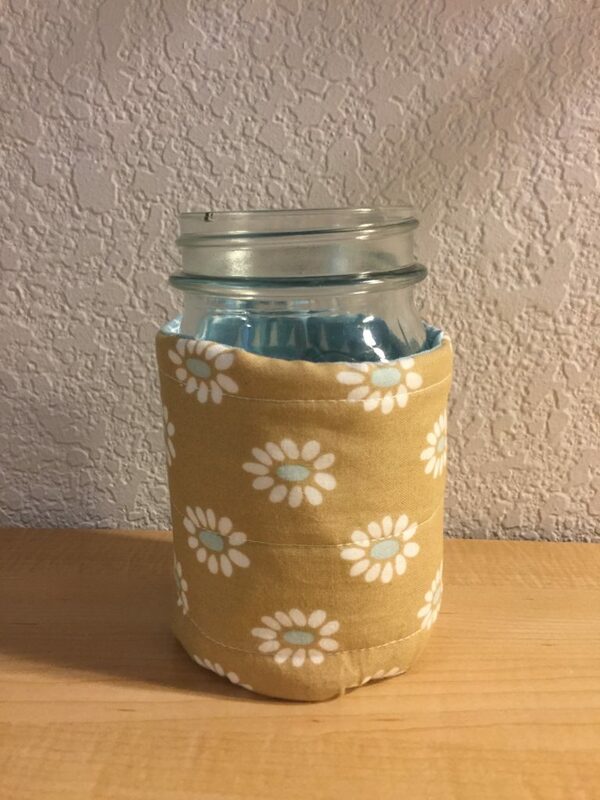 My quick sewing project for last week was this cozy for a pint size mason jar. My daughter in law takes jars of layered oatmeal (I think she puts fruit, milk and yogurt with the oats) to work and cooks them for her breakfast. She wanted a cozy for the jar because it gets fairly hot in the microwave. This isn’t exactly gorgeous, but I am fairly happy with it. First I measured the girth of the jar and the height I wanted. I cut two rectangles of fabric and one of batting, each 4 3/4″ x 11 1/2″. 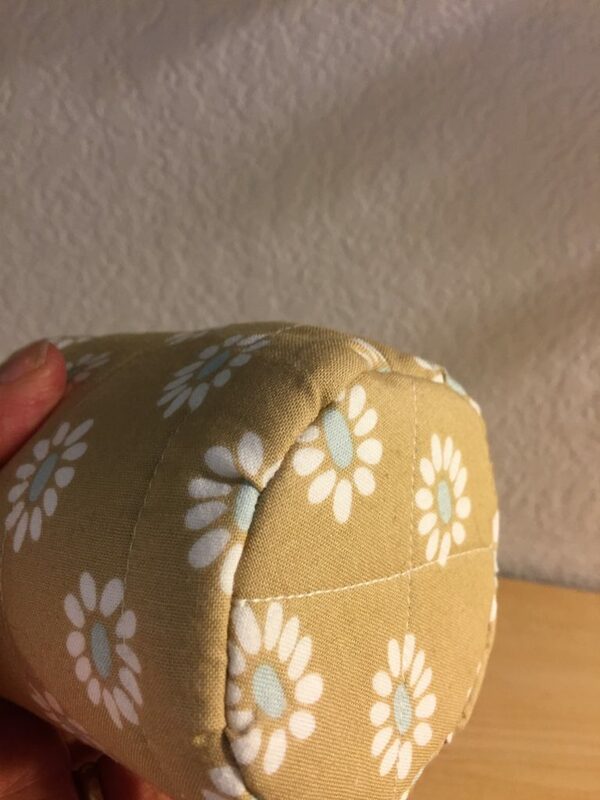 I also cut two circles of fabric and one of batting, 3 1/2″ in diameter. Then I quilted the batting to the exterior fabric. Stitching a seam along the short side first, I then pinned the outer fabric circle to the cylinder I had made. That was the most difficult part. The week went by so quickly! School is in session again and we are back to our routine! Today I even did a bit of quilting on a baby quilt I am making. I love the way these flowers look. I backed the quilt with a vintage sheet I had thrifted a long while back. It is so soft! I will share this with you again when I get it finished up. 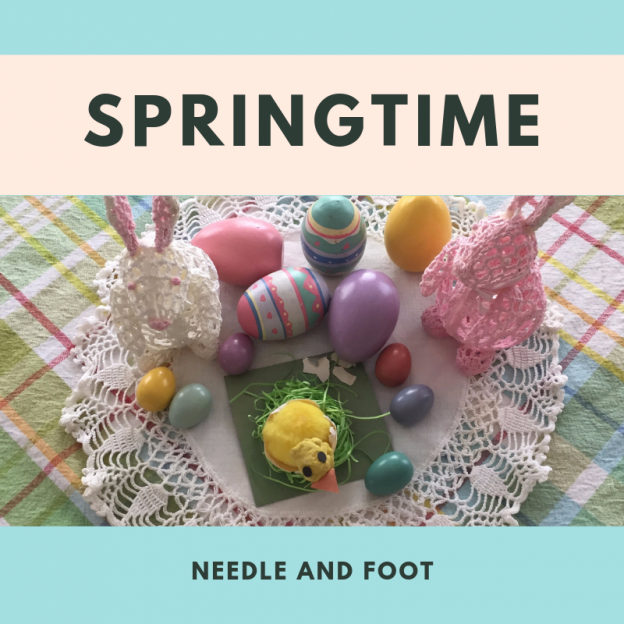 I hope you have been enjoying springtime! We are definitely in full spring season here in Northern California. 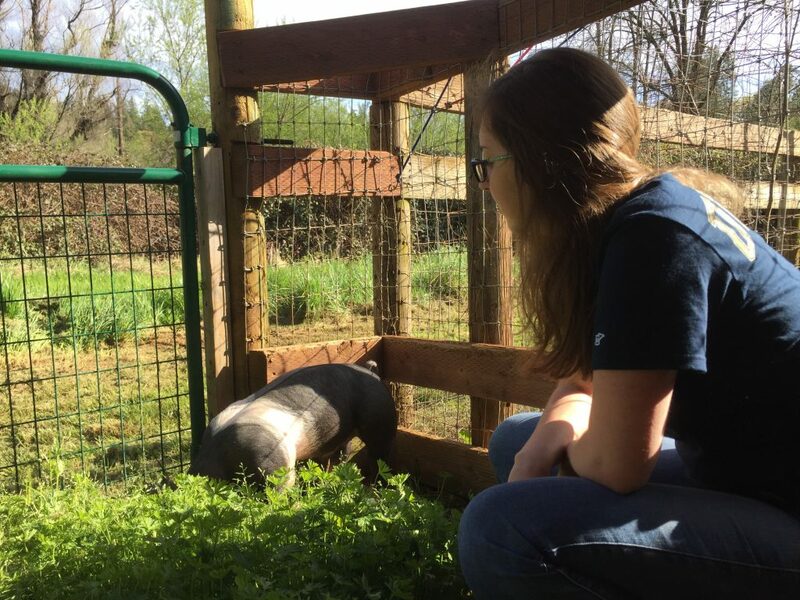 This entry was posted in Family, Gardening, Sewing Projects and tagged buttermilk bend trail, mason jar cozy, show pigs on April 23, 2019 by Bernie. Hurray – It’s Friday!! When you work at home, it doesn’t really matter as much that Friday rolls around, does it? But I still love that feeing of heading into the weekend. It is probably just ingrained in me from the years of being in school, working, having kids in school – Fridays are a great day! I am popping in with just a few things to tell you. Before we get started, you may have noticed the incredibly beautiful hatching chick in the picture above. Julia made it in first grade and it makes me smile to remember those days. Do you keep your kids Objet d’art from way back when? Ok, the first point of discussion is about commenting on various blog posts. There has always been this glitch in commenting on certain blog posts since I use WordPress for my blog. I know about fixing the no-reply issue and I have done that a couple of times but things are always changing and once again, there are many blogs I cannot comment on directly. Additionally, those blogs I can comment on (that are not on a WordPress platform) usually have a Captcha process to go through. I don’t mind this for the most part. Many of the blogs have it set so I usually have to click one round of objects (you know, the fire hydrant, traffic light, bus, car, cross walk or store front) but there are some blogs where I have to go through five and six rounds. To be completely honest, after the 3rd round or so, I just give up. It becomes a bother. Instead of just reading posts and not commenting, I have started to comment directly by using a blog reader. I have used Bloglovin for years to organize the blogs I follow and to keep track of those following me via Bloglovin. A while back they added a feature where a reader can comment on a post right there. It is not heavily used but it is so convenient. It does mean the author of the post has to check Bloglovin to see those comments. I cannot figure out a setting where they will notify me if I have a post comment on Bloglovin. That would be a great feature, so maybe one day. 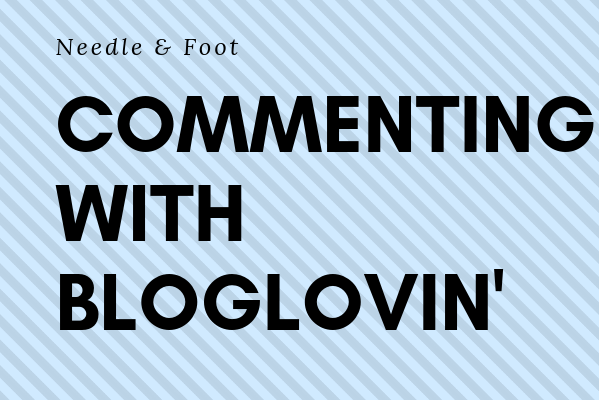 I just wanted to let people know that they might want to check Bloglovin and see if there are comments from yours truly or others on their posts. Not the perfect solution but I am going to continue to do this and see how it goes. At least I am trying to interact and not just lurk behind the scenes. As for sewing, I have been working on these cute blocks. This line is called Floriography. I had purchased a stack of it at least three years ago. I began a Tula Pink quilt with it but hated the way the blocks looked. I clearly didn’t know what I was doing and it gives me a headache just to look at those blocks! So, I decided to throw in some solids from my wonderful closet of stash and make these blocks. I want to make more blocks with the darker blue and pink before I really work on the layout. I am using a pattern (tutorial really) by Cluck Cluck Sew. I had pinned it long ago and decided this is a great use for it. I am looking forward to making more of these and putting it together. 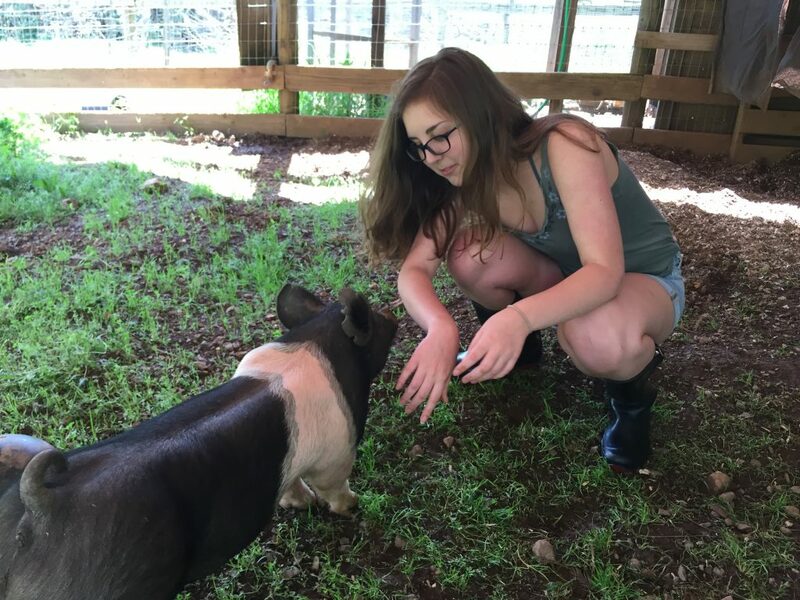 This weekend Julia selects her piggy for this year. She is pretty excited (actually, so am I!). My son and his wife are coming for a little family time and my parents are coming to dinner tomorrow night as well. I am thinking steak and shrimp for dinner with peach cobbler for dessert. This should make for a great weekend! 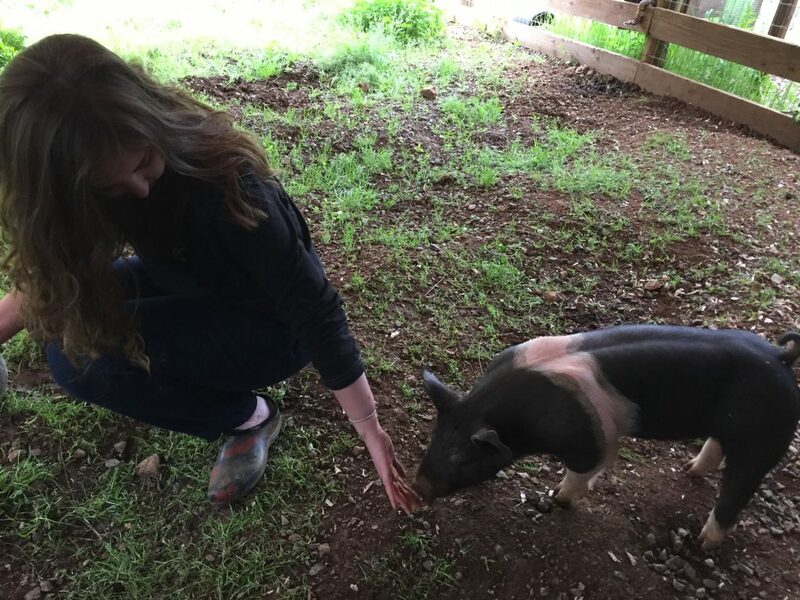 Family time, baby pigs, and good food. What more does this girl need? 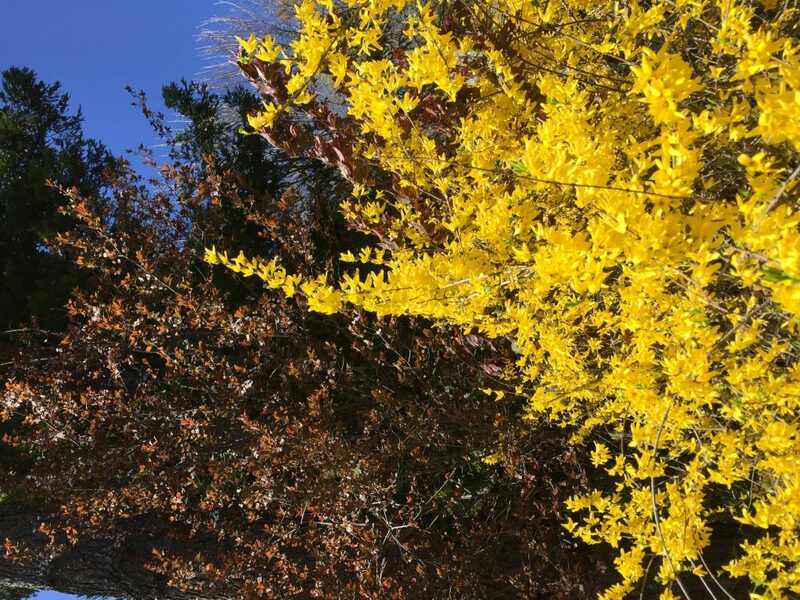 Check out my Forsythia blooms! So pretty this time of year! I cut some to bring in the house. The blossoms always drop everywhere but it doesn’t bother me. I love the bright yellow indoors! Remember – there is a great sale on Michael Miller Fabric over at my shop. Today and through the weekend, it is 50% off. There are some great stripes for quilt bindings and a few large scale prints that would make wonderful quilt backs. Come take a look! Have a great weekend everyone! Linking with Myra at Busy Hands Quilts for Finished or Not Friday. 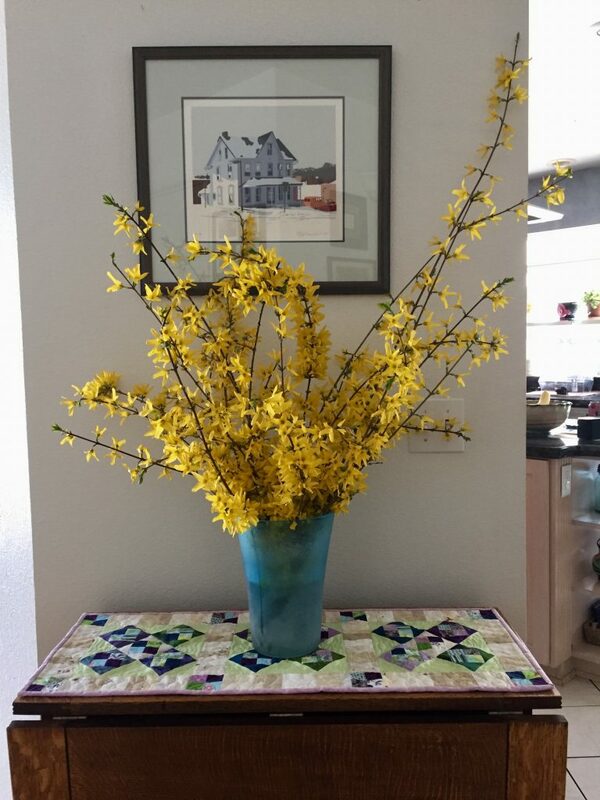 This entry was posted in Blogging & Commenting, string quilt and tagged blog commenting, bloglovin, cluck cluck sew, forsythia blooms, jelly roll quilt, strip quilt on April 12, 2019 by Bernie. Today is my stop on the String Frenzy Book Tour!! You may have already read a few posts about this new book by none other than Bonnie Hunter. Bonnie, queen of scrappy quilts, has been at it again and this new book is the result of hours and hours of work. If you are new to my blog, welcome! I am so glad you’re here and hope you will take a few minutes to look around. One of the things that impressed me about the book is Bonnie’s level of detail. She discusses the basics on block construction, string blocks, crumb blocks and foundation piecing. 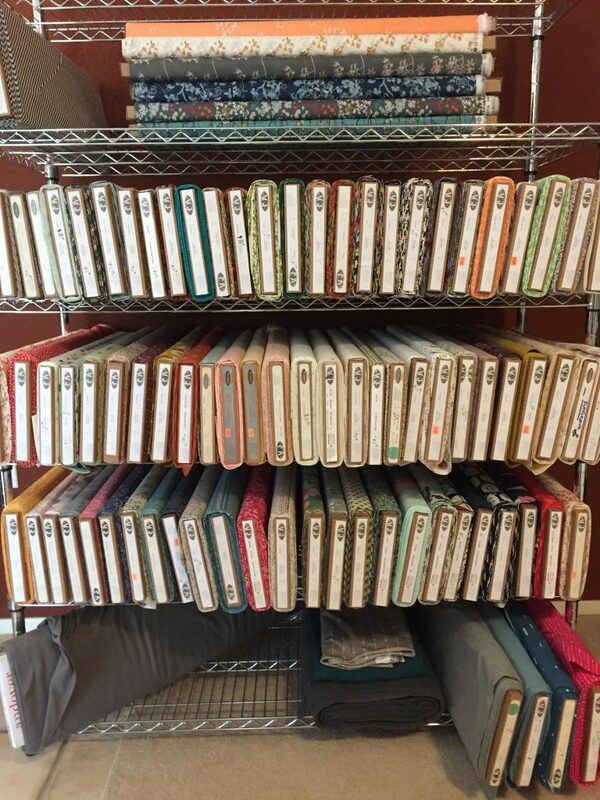 Lots and lots of great information for the beginner to intermediate quilter which is right where I fall. Once she provides a good basis of instruction, she moves into the patterns. This book contains twelve unique quilt patterns with wonderful instruction. The difficulty ranges from advanced beginner to intermediate skill level. 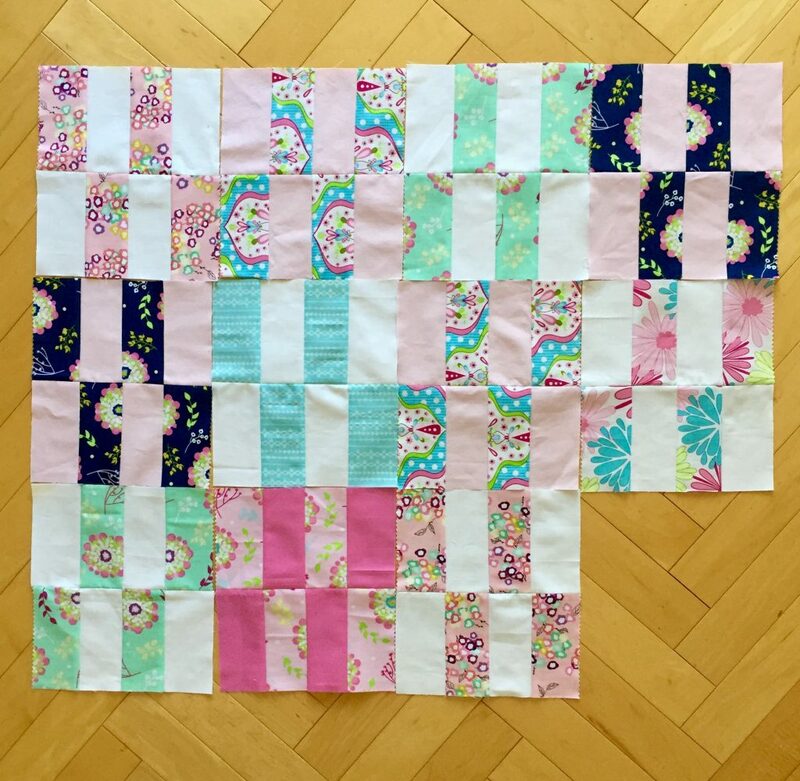 I haven’t made a scrappy quilt in a very long time, which is made abundantly clear by the overflowing scrap bins and the pile of scraps not put away (for lack of a bin to fit them into)! While I didn’t have time to make an entire quilt, I did want to try one of the patterns. Making a table runner seemed more manageable with the other projects I have going on right now. For my project, I selected the Daybreak pattern. 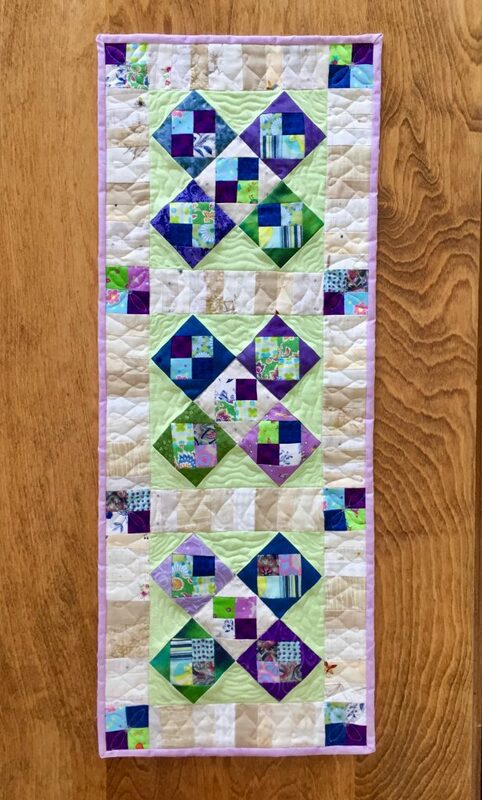 I liked the tiny four patch blocks and the string pieced sashing Bonnie used in this pattern. These four patch blocks each finish at 2 1/2 inches. I used strip piecing to make these which was pretty darn quick. When I was reading the book I decided rather than going with a totally scrappy look, I would choose a couple of colors to emphasize. My choices were green, blue and purple. Then I decided I would use a pale green for the setting triangles within each block. The borders were all pieced using my abundant supply of neutral scraps. I cut them into strings of varying widths and sewed large sections together. Then these were cut into strips measuring 2 1/2″ by 8″. Finished! My version of Daybreak, just three blocks in all! This is the finished project! I had intended to use it as a table runner but I really like it and am debating putting a sleeve on the back and hanging it in my sewing room. The finished measurements are approximately 12″ x 32″ and I have a spot on the wall that might work just fine. I need to think on that for a bit. Quilting it was enjoyable. It has been a while since I have done any free motion quilting. I stitched in the ditch around the five on-point blocks within each block because I knew I wouldn’t be quilting those. I wanted to leave them alone. Additionally, I used loops on the low volume scrappy sashing and some wavy lines on the light green triangles. As it should with a scrappy quilt, every bit of fabric came from my stash. I didn’t take a photo of the backing but even that was in the closet! Yay for using up some fabrics that have languished for a long while. All in all, this is a great book. 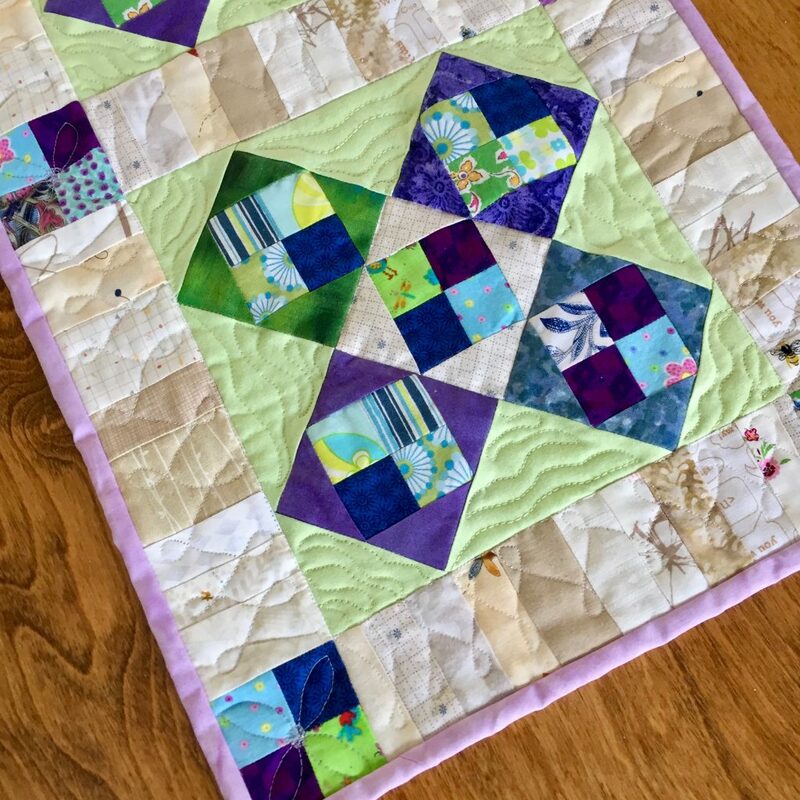 Lots of fun ways to use scraps and if you don’t want to make the entire quilt, go for a mini, a table topper or a runner. I love making smaller projects because there is a satisfying finish and practicing my FMQ is so much easier on small quilts. Bonus!! C&T Pubs has generously provided me with an e-book of String Frenzy to give to one lucky reader. Leave me a comment and let me know if you are a scrappy quilter. Do you make lots of scrappy projects? 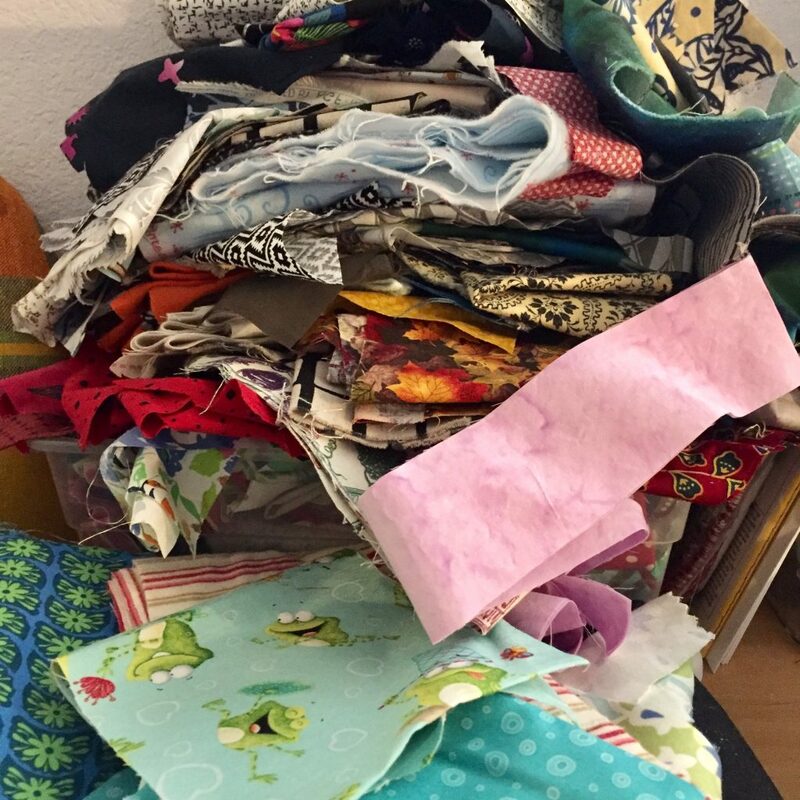 What is your favorite way to use your scraps – and what constitutes a scrap? Will you save a 1.5″ square? How small is too small?? Looking forward to hearing back from you. Giveaway open until Friday and I will draw a winner over the weekend! Sale happening in the shop this week!! Calling to all customers!! 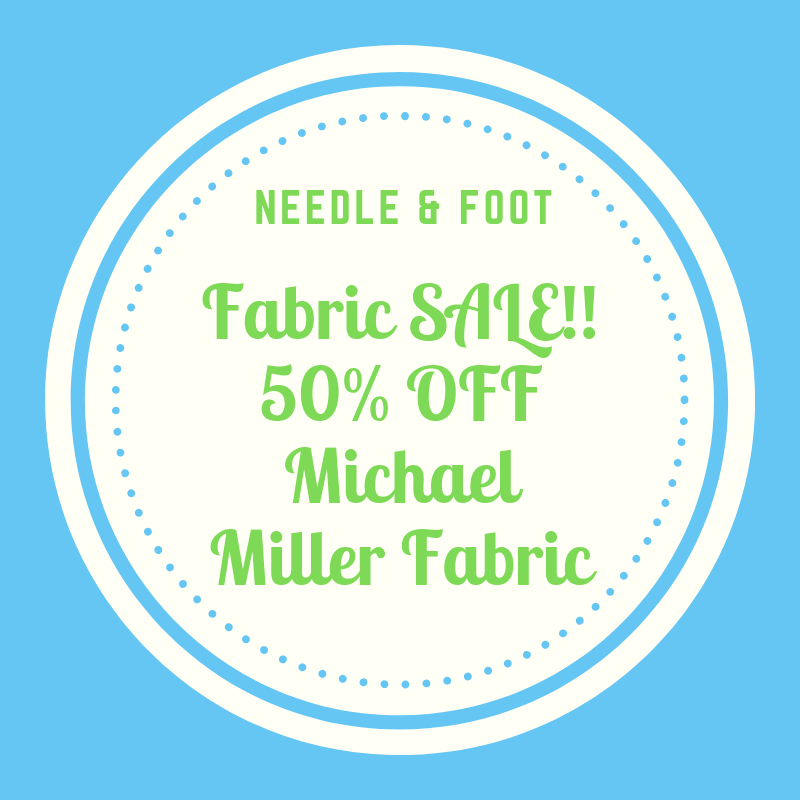 I have all Michael Miller fabrics on sale at 50% off through the weekend! Yep — Such a great deal. Hop over the shop and take a look. I am sure you will find something you love. Prices can’t be beat. Shipping is a flat rate of $6.99 no matter how large the order is. Happy Shopping!! 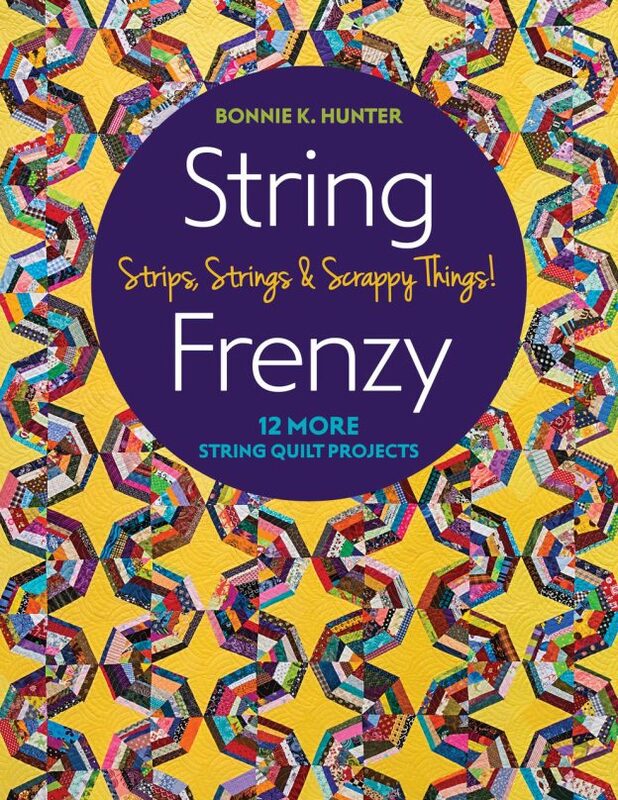 This entry was posted in Giveaway, Scrappy Quilting and tagged bonnie hunter, book review, daybreak, string frenzy on April 9, 2019 by Bernie. I am supposed to be at a class today. I have been really looking forward to it – Mel Beach came up from the South Bay to teach a workshop for our guild. But, as you can probably guess, the past two days were migraine days and I am wiped out today. It seemed ‘too difficult’ to cart the sewing machine and supplies and be in class, listening and comprehending a technique today. The day or two after a migraine are just weary for me. So, I am home. I thought I would catch up with you. It has been a while since I have shared the Mercyful Quilts I’ve received. They are just gorgeous, I am sure you will agree! 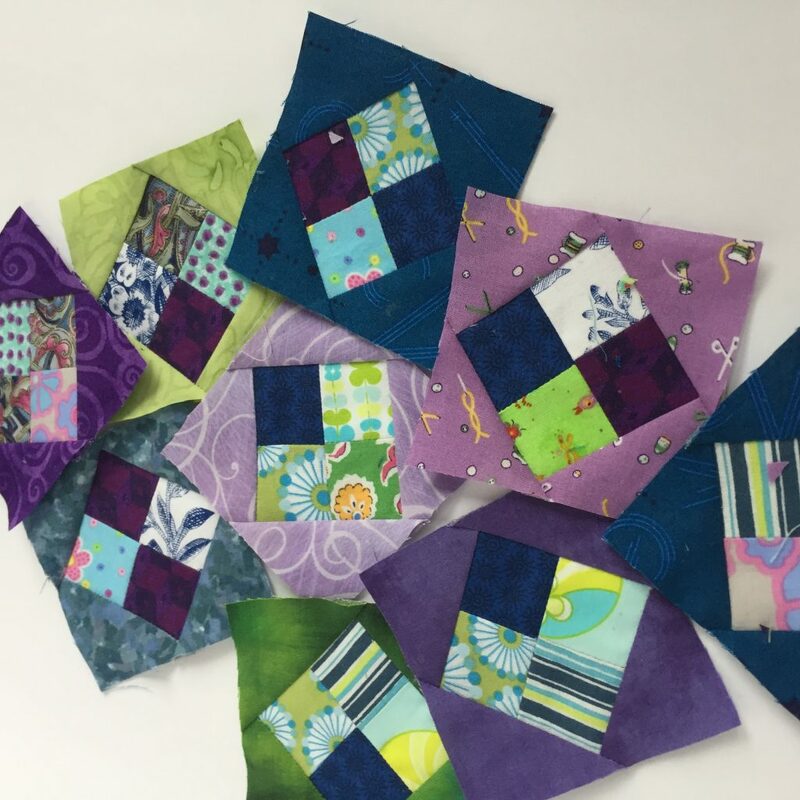 Six new beautiful quilts for Mercy Hospital! As always, the quilts are stunning. Each one is so unique and more beautiful than the last. Mercy Hospital’s Palliative Care team is so grateful for these. 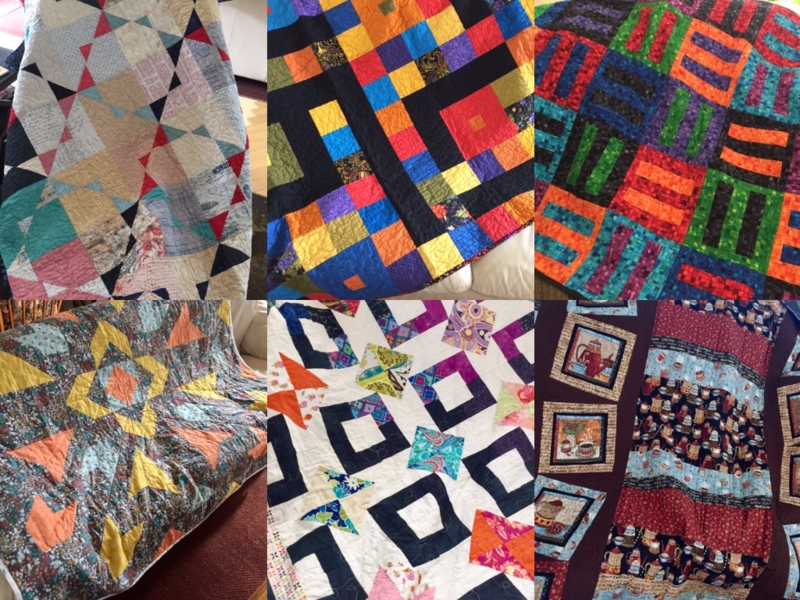 I hope you know how much your work and generosity are appreciated by staff and the families who are given these comforting, loving quilts. If this program is new to you, read this post and this one to see what it is all about! I could drool over these Art Gallery bolts all day long. I have been running out of space in the shop so I ordered a wire shelving rack. It is now filled with Art Gallery Fabric, my favorite of all fabric. Isn’t it a pleasure to look at this and just think of the projects one could make??? I have a box of AGF arriving today and I can’t wait. There will be a couple of new colors from the Pure Elements solid line as well as a few more from Maureen Cracknell’s Sun Kissed line. It’s like Christmas morning every time a box shows up!! Did you have any idea of all the choices?? OK – Better get busy. My project for today is to make a couple of simple curtains for the Downieville house. There is a stairwell off the kitchen, leading to the basement and it has a couple of windows. Those windows are single pane and can be quite warm in summer and chilly in winter. 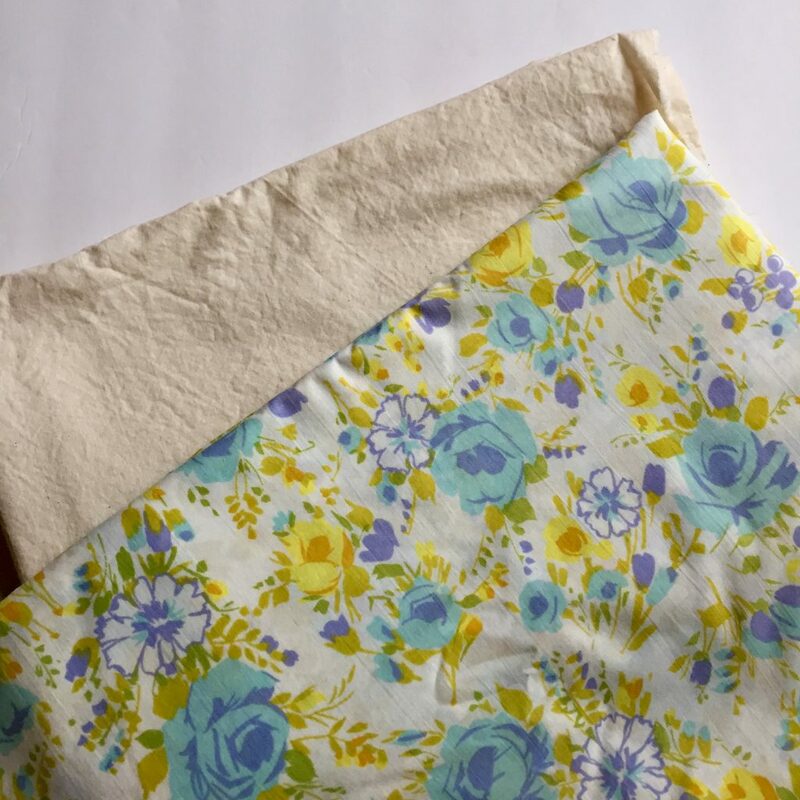 I am going to use this vintage sheet and line them with a heavy muslin. I think that will help and they will look cute. The old fashioned floral is perfect for the house. I have an old curtain from the window to use for measurements so this should be a quick project. (if my post-migraine brain cooperates.) Wish me luck! If you haven’t yet read the fantastic comments and discussion on this post, please do! 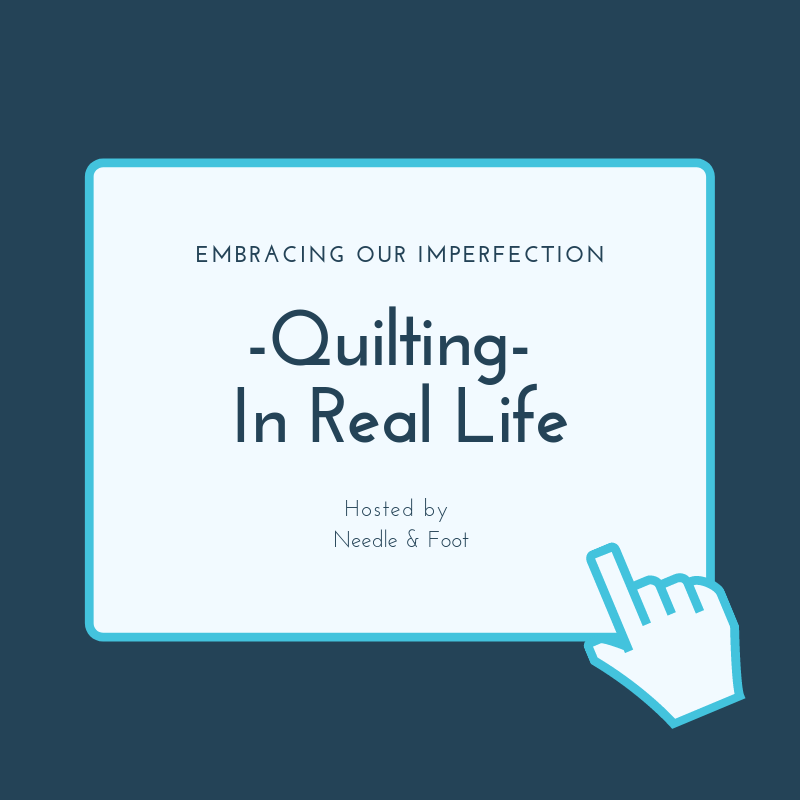 So many quilters are sharing their mistakes and quilting blunders. So funny to read these and very validating!! There is time to enter a comment sharing your experience as well. ( I am definitely reading all of them and trying to comment on most – it has been a challenge because of my head.) Prizes are offered!! Winners drawn Saturday morning. Go check it out. 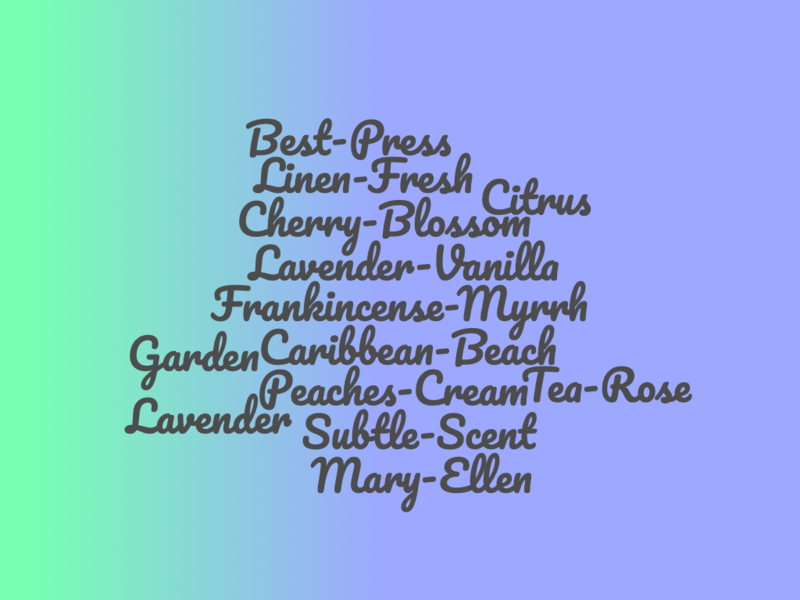 This entry was posted in Donation Quilts, Merciful Quilts, My Fabric Shop, Tips and tagged Mary ellens best press, mercyful quilts on April 3, 2019 by Bernie. I have thought about hosting an event like this for a long while now. Occasional frustration while scrolling my various social media feeds got me thinking. 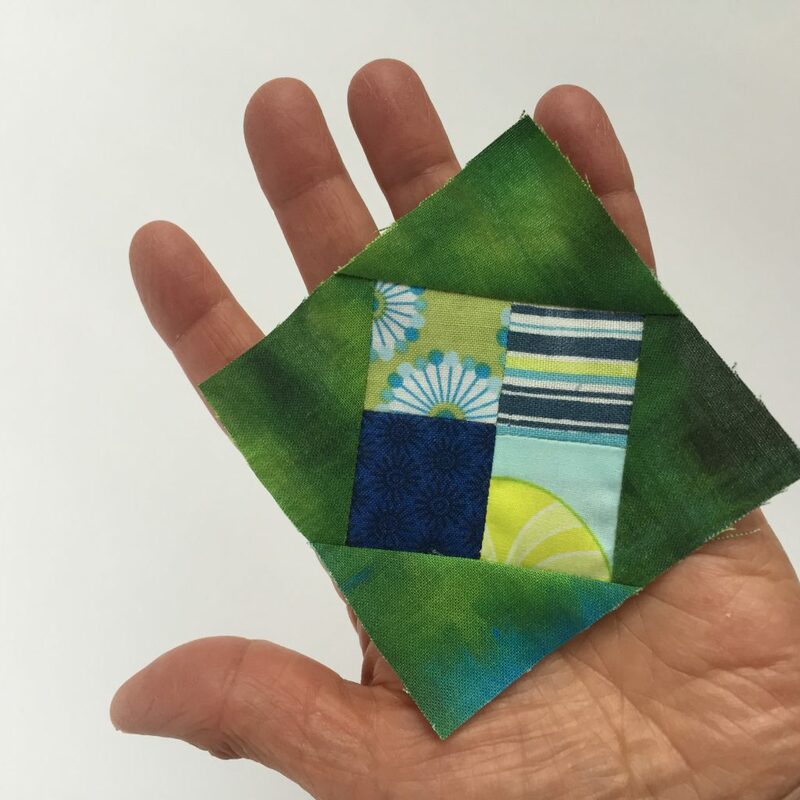 While I do love the inspiration found on Instagram and Facebook, sometimes it makes me wish I were more skilled or more artistic or more prolific a quilter or more, just more. Know what I mean? It seems to me we should share both – the mistakes and the achievements, the blunders and the best of our work. This would present a balanced picture, it would show quilting – in real life! In an effort to do this, I invite anyone who wants to share to leave a story in the comments. Explain what your mistake was, how you did or didn’t fix it, and what you learned from it (if anything!). Bloggers – if you write a post describing the same, please put the URL in a comment so we can all click through and read about your silly mistake or misunderstanding. I have so many I could tell you about but I have chosen one big one that I chuckle about almost every time I bind a quilt. I would define this as a complete misunderstanding. I don’t have any wonderful pictures to illustrate this so I will just have to tell the story. When I started quilting, I basically taught myself. This was back in the late 1970’s. 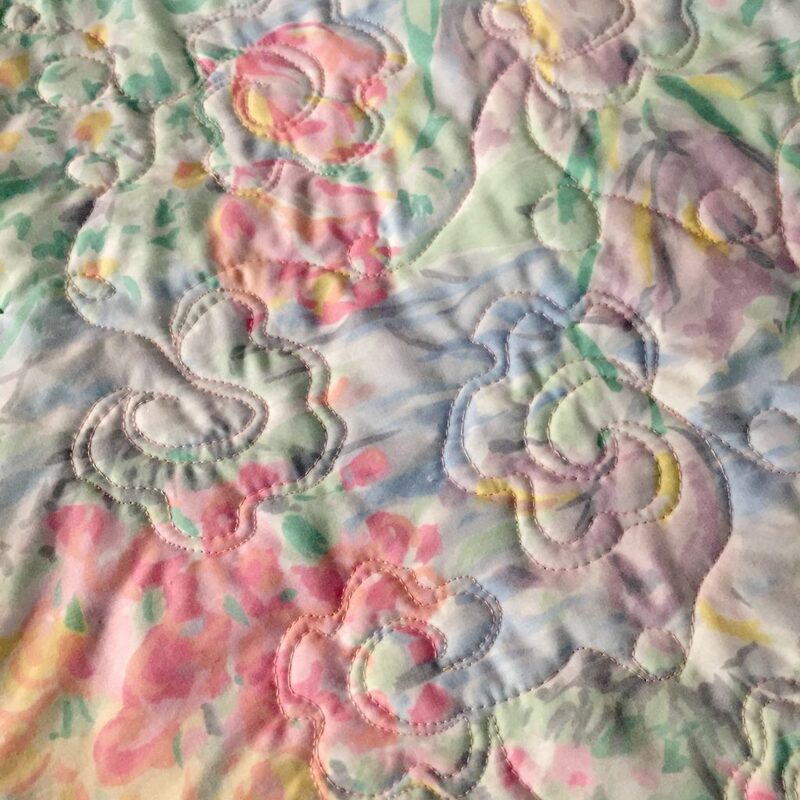 At that time, I made three quilts – each one queen size. I had no clue about actually quilting a quilt so they were hand tied. Also, I didn’t know about binding a quilt so they were sort of made ‘envelope’ style. I layered the front and back, right sides together. Then I stitched around the perimeter, leaving an opening large enough to turn it right sides out. Then, get this, I took a layer of polyester batting and inserted it into the quilt and basically crawled in with it as far as I could to smooth it out. So the batting wasn’t really stitched in to anything and you can bet it was lumpy but I was 17 or 18 and I thought this was fine. This is sort of the back story – it isn’t the misunderstanding. We haven’t gotten there yet! I just wanted to tell you where I was coming from as far as quilting knowledge goes! It helps to know that though I began sewing when I was 11 years old, I made clothes – not quilts. I took home ec classes in high school and learned a lot about sewing then. You can read a post here that talks more about those classes if you like. The rules for making clothes are quite different than those for making quilts. This is what caused my major misunderstanding!! Fast forward from 1978 to 2010 and I began quilting again. This time I had the benefit of all the tutorials on the internet. I read many and they were (and still are) very helpful. Some of the first projects I made were minis and table runners. Then I moved on to trying to make some lap size quilts. Binding quilts was quite tricky for me. 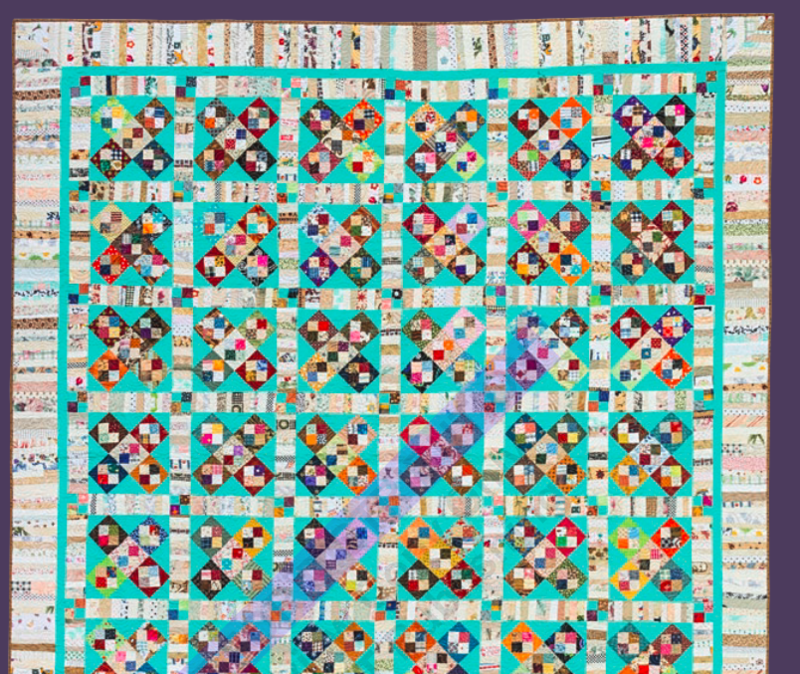 I would look at the pictures of other quilts and the crisp bindings with beautifully mitered corners and wonder why the heck mine looked so weird. Want to know why? Let me tell you. For the most part, I understood the process of making the double fold binding, stitching to 1/4″ before the corner and then off the corner, then I mitered the corner as I turned. All of that worked well. Once I got the binding entirely stitched on, I made my mistake. I assumed that the 90 degree corner needed to be clipped! After all that work, I went to each of the corners and snipped them off!!! No kidding. I didn’t do this only once either. I did it to a couple of quilts before I figured it out. 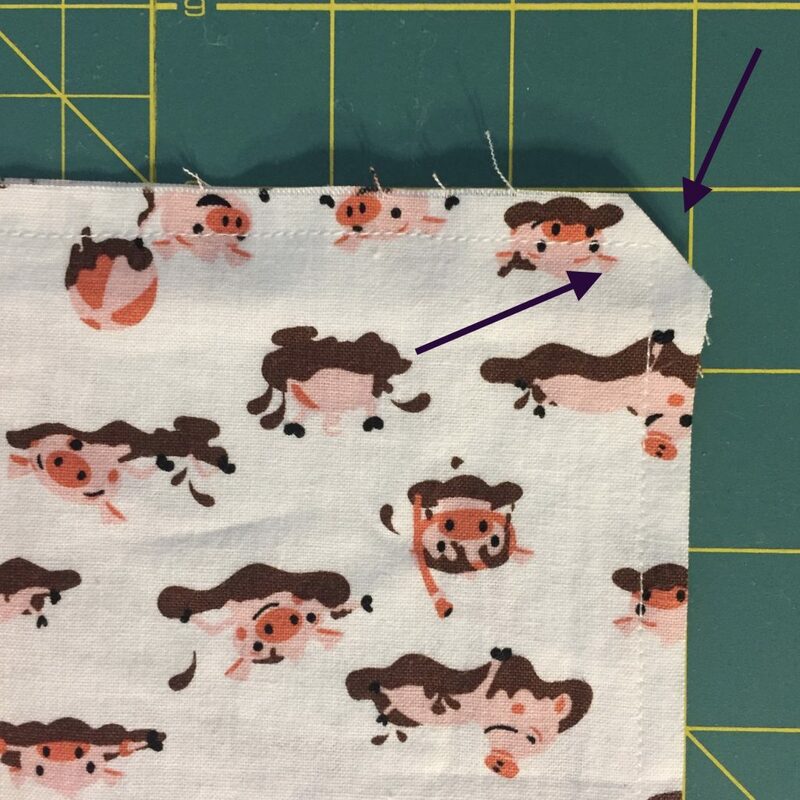 When sewing clothes, pillow cases or anything with a 90 degree angle, the corner is clipped off so when you turn it right side out, there is a nice crisp corner without excess fabric bunching it up. Well, as we know, bindings are folded over the corners and the corners need to be intact so they fill the binding. My habit to clip those corners was so strong I just did it automatically. Let’s just say the bindings on the first couple of quilts were very weird indeed. I don’t have any pictures of this. But I assure you, I did it repeatedly. We are all constantly learning. 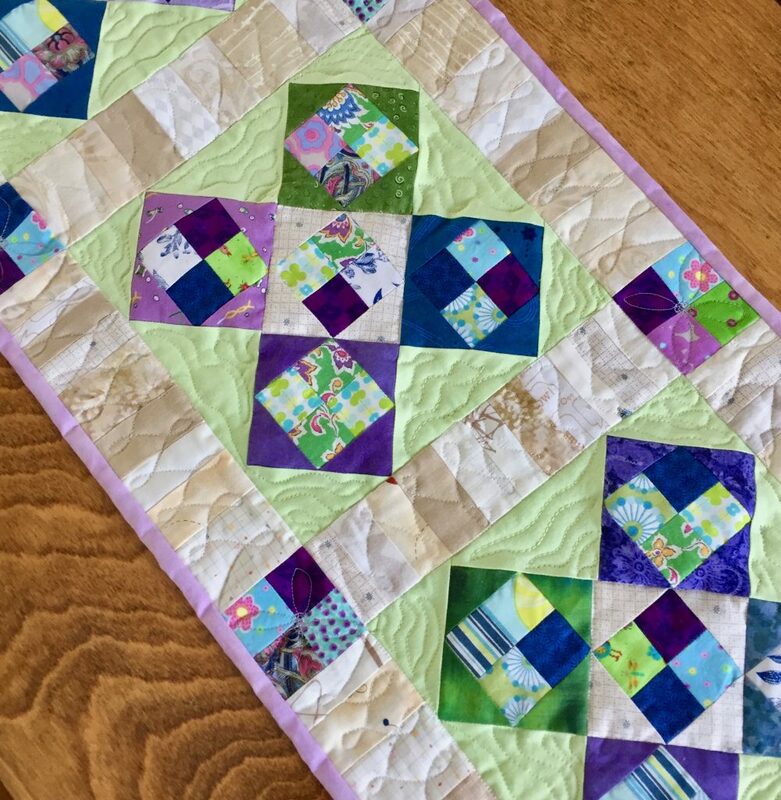 Many of my readers are amazing quilters, some are quite new to it and others are like me – gaining confidence with much still to learn. But – we are all right where we should be. Our projects should not be compared. They are as unique as each of us which is what makes life interesting. I am looking forward to reading tales from others about your blunders, mishaps and misunderstandings! I had planned to have a link up ready for those with blog posts. Well, the weekend got away from me and it didn’t happen. Instead, bloggers, please leave the URL link to your blog post in a comment. Readers, please scroll the comments and click through to read the mistakes others have made. I can almost guarantee I will both learn something by reading these and will also have a laugh or two. For readers who are not bloggers, will you tell your story of a mistake or goof you made? Explain it, tell us how you did or didn’t fix it – share with us! Your story in a comment enters you in the drawing for the prizes! Readers, if you want to comment on others stories, please feel free. I think this will be a lot of fun. Thanks to everyone for participating! We need to encourage each other – one way to do this is to show both sides; our successes and our blunders! 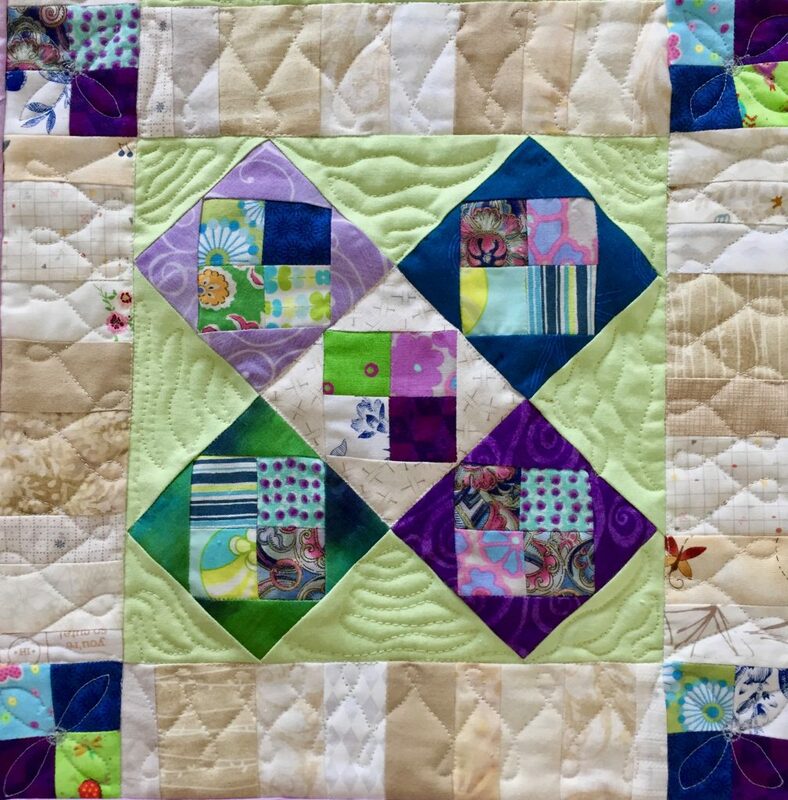 This entry was posted in Blog event, Quilting Skills on April 1, 2019 by Bernie.